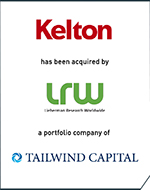 Intrepid today announced that it acted as the exclusive financial advisor to Kelton Global, a premier, insights and strategy consulting agency, on its sale to LRW, a leading global market research and data analytics company and a portfolio company of Tailwind Capital. We understand that human behavior drives innovation. Intrepid understood our value proposition and communicated it effectively to the market, finding us the right partner in LRW. This was a win-win for both teams, Gareth Schweitzer, Founder and President of Kelton further commented. Intrepid Investment Bankers (Intrepid), a leading middle-market investment bank, announced today that it acted as the exclusive financial advisor to Kelton Global (Kelton), a premier, insights and strategy consulting agency, on its sale to LRW, a leading global market research and data analytics company and a portfolio company of Tailwind Capital. Founded in 2003 by Tom Bernthal and Gareth Schweitzer, Kelton has grown from a two-person office to a global consultancy with a national footprint that is called upon to address critical customer, brand and product needs across the Fortune 1000. Kelton has deep expertise in qualitative insights, quantitative research, cultural insights and design research and uses its communications, innovation and branding teams to lay the foundation for new ideas that help global businesses chart new paths for growth. “Kelton has a unique approach to research and strategy rooted in journalism that emphasizes human understanding and storytelling and an ability to hone in on important information and then effectively communicate it,” said Tom Bernthal, Founder and CEO of Kelton. “We understand that human behavior drives innovation. Intrepid understood our value proposition and communicated it effectively to the market, finding us the right partner in LRW. This was a win-win for both teams,” Gareth Schweitzer, Founder and President of Kelton further commented. Kelton is a trusted partner to 45 Fortune 100 companies. With offices in New York, Los Angeles and Chicago, the firm employs nearly 100 team members and is often hired to solve companies’ most difficult challenges. Notable clients include Google, Uber, Pfizer, Nike, Facebook, Harley-Davidson, Target, and MillerCoors across six categories: technology, media & entertainment; consumer products; retail & apparel; healthcare, food & beverage; and financial services. In addition, Kelton has received numerous industry awards, including: Target’s “Best of the Bullseye Award”; “Ogilvy Awards for Excellence in Advertising Research”; “2016 Marcom Awards for Exceptional Branding Work”; “2017 SR 50 Best Places to Work”; and was recently recognized as a “2017 AMA Gold Top 50 Research Firm” for the fourth straight year. LRW is a global, data-driven company that has been advising top global brands on issues of strategy, branding, communications, product development, innovation and customer experience since 1973. The firm is one of the largest, privately-held marketing research consultancies in the world with more than 600 employees in nine offices worldwide. The acquisition of Kelton is the latest in a planned series of acquisitions in support of its long-term vision of creating a collaboration of companies that leverage sophisticated data analytics and deep human understanding to deliver business impact for clients.